Note: To view the photos in the slideshow, click on the blue arrows in the main photo above. Jan. 23, 2015 (LifeSiteNews) - Reports are coming in that dozens of buses of March for Life participants are still stranded (as of Saturday evening) on the Pennsylvania Turnpike, after a small accident caused a huge back up of traffic Friday evening. The massive dumping of snow then left many of the buses unable to carry on. LifeSite spoke with several of the groups that are stranded, and spirits are reportedly high. One group of Catholic students from Omaha and Minneapolis- St. Paul were suggested that all the pilgrims celebrate Mass. 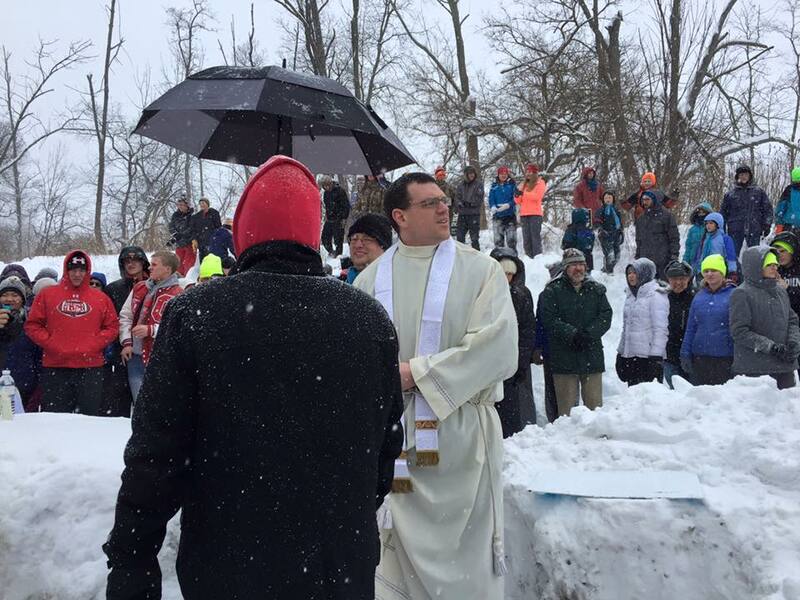 Without a proper altar available, they took things into their own hands and made an altar of snow. The Missionary Benedict Sisters from Norfolk, Nebraska posted that, "Word spread around, and on one bus, the priest had around 300 hosts, and offered to celebrate the mass. Well word travelled around fast and soon we had like 6 priests and 500 people there. God is good!!!" Mass outside. In the blizzard once in a lifetime experience. The Mass was said by Fr. Patrick Behm and a number of other priests. The Cheboygan bus just got freed! There are still four miles of busses waiting, though. They were first stopped around 10:30 on Friday night. There are over 2200 Marchers stuck on just our little section of the turnpike. I counted 24 buses among the dozens and dozens of semis who are still stuck. I walked about a half mile up the turnpike and talked to every charter bus on the road. I wrote down who the buses were and how many other buses from their group were also stuck. Two more from Iowans for Life. One more from Michigan- Cheboygan Right to Life.